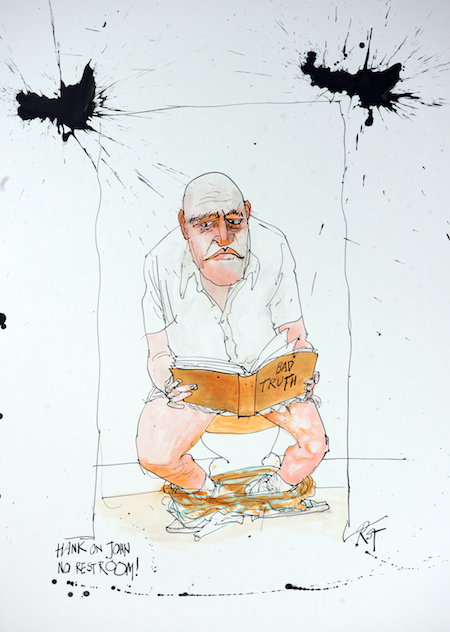 Ralph Steadman was born in 1936 in Wallasey. One of his earliest memories is hiding in an Anderson Shelter during an air raid in WWII while his mother knitted. Before the end of the war the family moved to North Wales and ended up staying once the war ended in the North Wales town of Abergele. Ralph attended Abergele Grammar School but was terrorised by the headmaster who routinely caned boys and it lead him to believe that “Authority is the mask of violence”. Ralph is in the photograph below – spot him if you can! 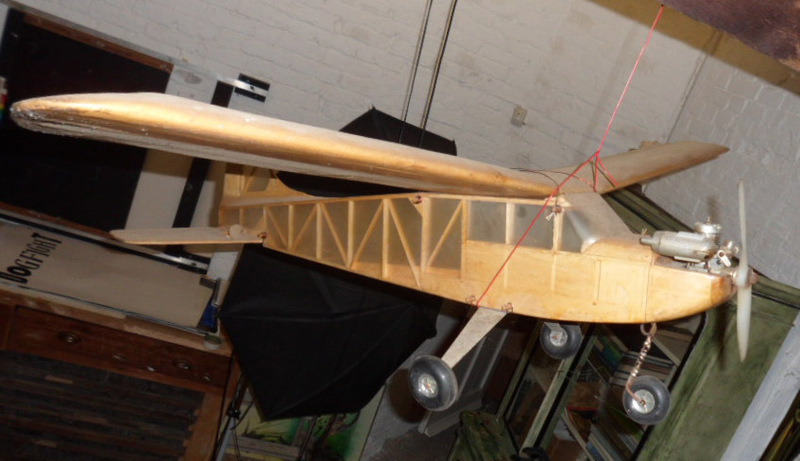 One of Ralph’s favourite pass-times growing up was to make model aeroplanes. He would rush home from school and would always complete any outstanding homework before allowing himself to indulge in his hobby. This work ethic has remained with him and later, when he began working with Hunter S Thompson would lead to no end of irritation from his tall, trans-Atlantic friend when Ralph would often have completed his drawings before Hunter had written a word. Model Aeroplane making likely lead him to his first job at de Havilland Aircraft Factory as a radar operator. It was here that he picked up the skill of technical drawing, a skill that has featured in his artwork throughout his career. He left de Havilland after a few months however, unable to bear the monotony of factory life. Having completed his National Service in 1954, during which time he completed the Percy V. Bradshaw Press Art School correspondence course, he moved to London and started work as a cartoonist. He went to meet Percy V Bradshaw once and commented that the course was a little old-fashioned. Bradshaw sagely responded “The principles of drawing will always remain the same, dear boy”. 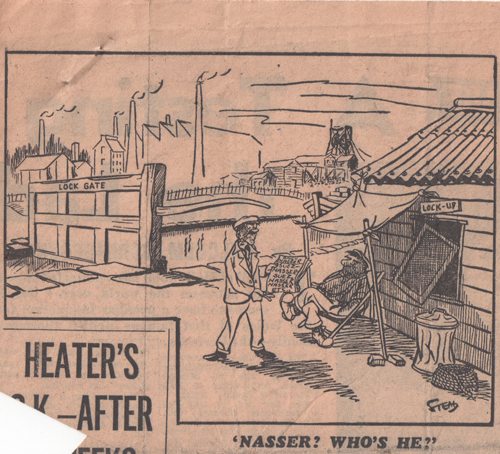 His first cartoon was published in the Manchester Evening Chronicle in 1956. In 1961 he wrote to the editor of newly founded Private Eye and began to explore a new, more provocative style, drawing on influences like George Grosz and John Heartfield. 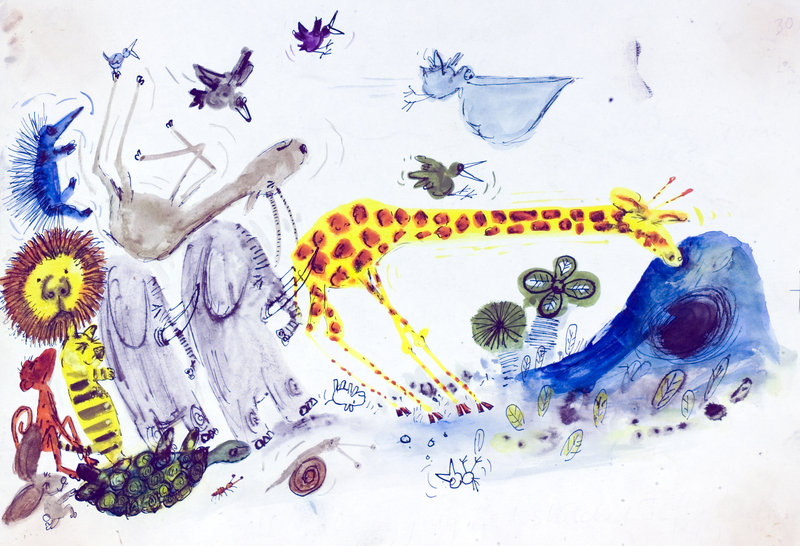 During the 1960s he illustrated several children’s books, including Fly Away Peter (1964 featured right), The Big Squirrel and the Little Rhinoceros (1965), The False Flamingos (1967), and The Jelly Book (1967), which he also wrote. His work was regularly appearing in New Society, Radio Times, Town, New Musical Express and the Daily Telegraph. In 1967 he began work on his illustrated Alice in Wonderland, which won the Frances Williams Award in 1972. 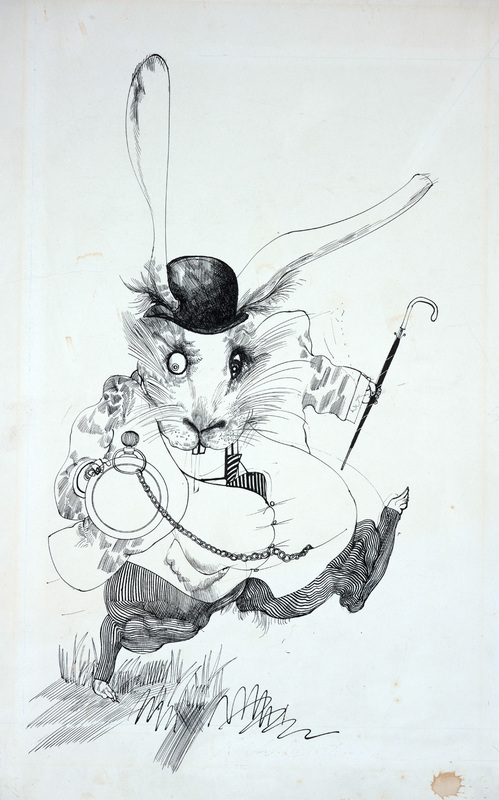 Steadman updated the classic Tenniel illustrations for the 1960’s turning the White Rabbit into a commuter, perpetually late for work, the Mad Hatter became a union leader and the Caterpillar suddenly began to resemble John Lennon enshrouded in a fog of smoke. His big break really came in 1970. Having published his first collected book of cartoons, Still Life with Raspberry, with it under his arm, he set off to America to cover the Kentucky Derby for Scanlan’s Monthly, where everything would change on his meeting Hunter S. Thompson. 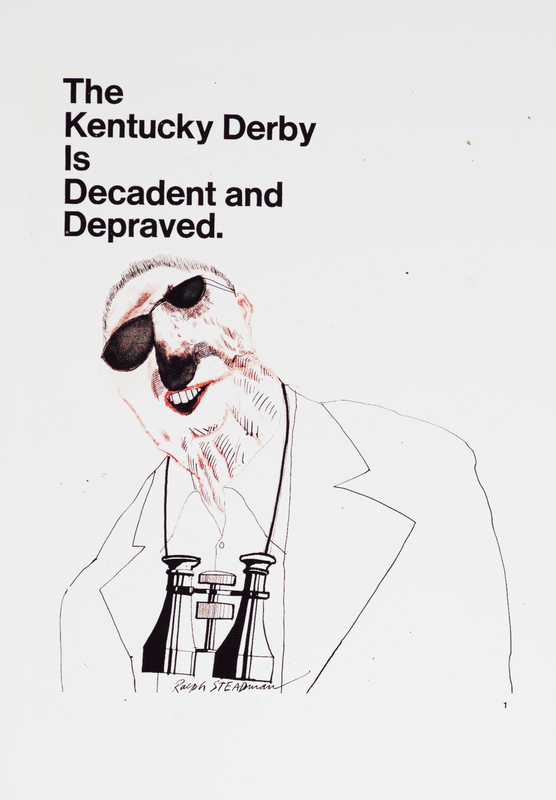 Described as “a Hell’s Angel who had shaved his head”, Steadman set off to meet this maverick journalist at the Kentucky Derby. Legend has it that it took them 3 days to find each other. Ralph often recalls that Hunter commented when they finally met, “Well they said you were weird, but I did not think you would be that weird!”. Warned not to do any of his “Filthy scribbling” Ralph almost caused a fight at the Pendennis Club in Lousiville before being maced by Hunter to help him escape. Together Ralph and Hunter would develop ‘Gonzo’ journalism, where you do not simply cover the story but become the story. So began a lifelong collaboration, including the iconic Fear and Loathing in Las Vegas, which was originally serialised in Rolling Stone Magazine. Another lifelong association was begun, and Steadman is still listed as Gardening Correspondent for the legendary publication. Between projects with Hunter, including Fear and Loathing on the Campaign Trial ‘72, The Curse of Lono (1983) and Polo is My Life (1994), and numerous pieces for Rolling Stone, Steadman continued to produce his own books, including Sigmund Freud (1979), I Leonardo (1983), The Big I Am (1998), as well as children’s books such as That’s My Dad (1986), No Room to Swing a Cat (1989) and Teddy! Where Are You? (1994). 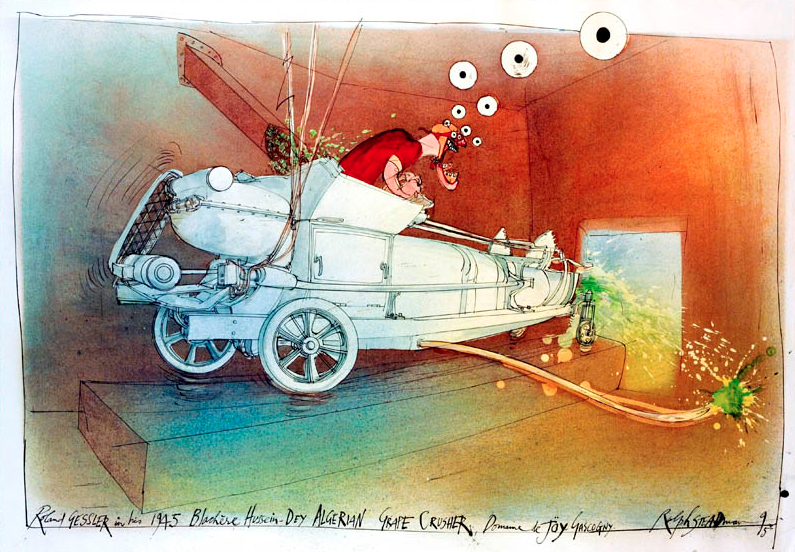 In 1987 Steadman was approached by Gordon Kerr at Oddbins to travel the vineyards of the world and produce artwork for their catalogues. Gordon remains a friend and now writes condensed history books. Between 1987 and 2000 he did just that, producing hundreds of artworks, many of which would eventually appear in his two award- winning books on wine, The Grapes of Ralph and Untrodden Grapes, and his book about whisky, Still Life with Bottle. He has always diversified in his career, producing theatre sets for a ballet of The Crucible (2000) performed at the Royal Opera House; a production of Gulliver’s Travels (1995) for Clwyd Theatr Cymru; and an oratorio and images for an eco-opera, The Plague and the Moonflower, with music composed by Richard Harvey. More recently he has illustrated three books about extinct and endangered birds and animals with Documentary film-maker and co-Gonzovationist Ceri Levy, Extinct Boids (2012), Nextinction (2015) and Critical Critters (2017). Levy approached him tentatively through another acquaintance, Lady Catherine St German’s whose husband, Peregrin started the charming Port Eliot Festival. 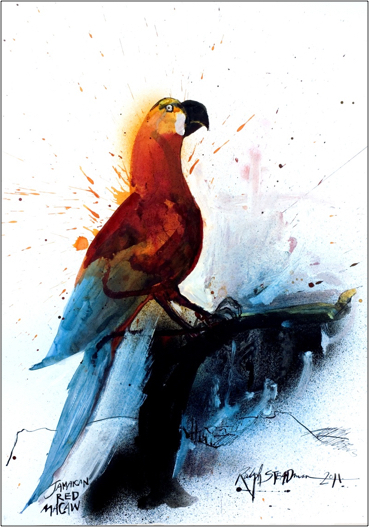 He was putting together a show of artworks, The Ghost of Gone Birds, to feature extinct birds by a variety of artists and he asked if Steadman might submit a drawing of an extinct bird of his choice. Levy often muses that he had no response for several weeks and suddenly 4 extinct birds appeared in his inbox and lo, the Gonzovation Movement was born. 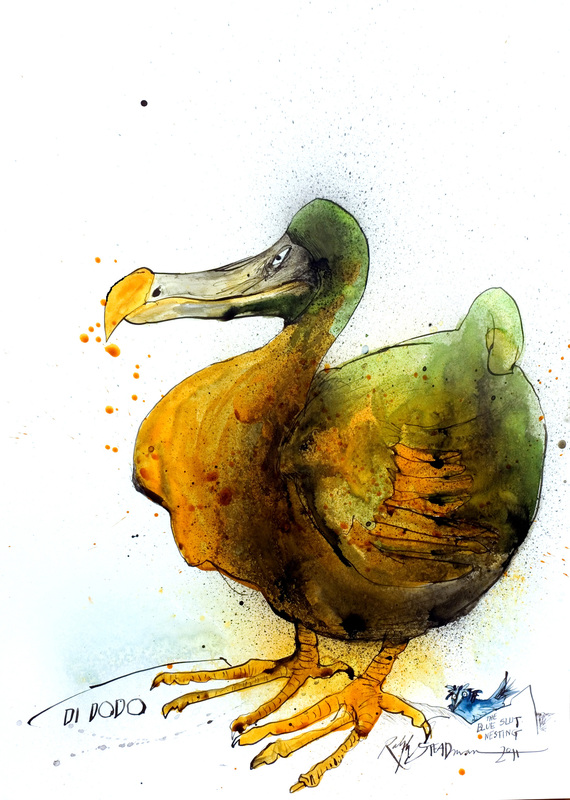 Steadman ended up producing over 100 images of extinct birds, and imagined boids, which Bloomsbury then published. Steadman’s artworks were all hung, side by side in rows in one room and binoculars were provided for the viewers to view them through. Following on from Extinct Boids they naturally decided to collaborate on book about critically endangered birds entitled Nextniction and then to endangered animals called Critical Critters. In between all these Gonzovation projects, Ralph was asked by Vince Gilligan the collectors DVD Box Set artwork for his hit series, Breaking Bad. He produced portraits of 7 of the cast members, 6 of which appeared as the DVD box covers. Only one was unused as the artist would not grant permission for its use and so the image sits in a drawer, destined to be unused and unseen. The image featured right is an unused portrait of the character, Hank. At the end of 2018 he also worked on visuals for the poster art for a brand new Broadway show, Gary: A Sequel to Titus Andronicus starring Nathan Lane. In 2012 a film of his life and influences, 15 years in the making, called For No Good Reason premiered at the Toronto Film Festival to critical acclaim. Ralph is still drawing and producing art today, working regularly for the New Statesman, The Independent and the New York Observer, as well as working on his own projects. He is a maverick and trail blazer whose art inspires and influences artists today.